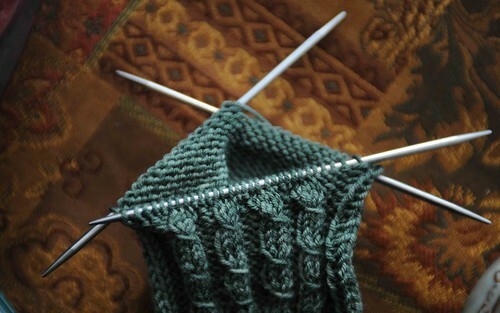 Oh Christmas Knits, will you be finished in time? This is my first Christmas that I would officially call myself a knitter. Which means, of course, that I have some knitting projects for the special people out there who would appreciate hand-knit items (one such item elusively pictured above). Unfortunately I have made a rookie mistake in my project planning. The projects I chose were too complicated. As a working mother of a 3-year-old son (as well as a wife and daughter), there are just not that many hours in the day where I have free time AND the energy to do something useful with it. I started the above gift in October thinking I had plenty of time, but I fear the worst for this complicated Christmas knit. c) make sure I enjoy the pattern, or else, let’s face it, it will be a chore to get done! Ok, heading home now after work. Perhaps tonight I’ll get a little time and still be alert – we shall see.